Thankfully, foreigners who already possess a driving license from another country don't have to sit a practical exam in one of the mock-up test centres in the city's far-flung suburbs. Instead, you'll need to get your foreign license translated. This bit isn't too difficult, but feels like a bit of a rip-off. Getting your license translated seems fair, except that this has to be done by an official notary office and they'll charge you 50RMB for a few seconds' work. Alas, there's no way around this, so you just have to grin and bear it. You'll also need a document stating that you are healthy enough to drive on the road in China. You can get one of these from whichever hospital you usually attend, but there's also a health check centre at the SVMB itself (address below), which is primed for carrying out the necessary checks. As you're going to be visiting anyway, you might as well do the health check on site. If you're not already there for your health check, it's time to head to the SVMB itself. The main office is stuck out in Gubei and not particularly near any metro stations (the closest is Shanghai Zoo, but it's still a bit of a trek from there). Given that you can't drive there (yet), you're probably best off getting a taxi over. The address is 1330 Hami Lu, near Jinbang Lu. It's easy to think that you'll be able to pass the theory test for a Chinese driving license based on your prior driving experience abroad and just general road safety logic. But if you think that, you may well be in for a nasty shock. The interwebs are full of people detailing their failure to pass the required 90 percent on the exams – check out this account of utter bewilderment from NPR. Rather than rely on your own instincts and experience, you'll need to memorise the answers to the exam questions. There are 1,500 of these from which the 100 you sit will be chosen, though many of them overlap or deal with similar issues. They cover everything from traffic police hand signals and length of jail terms for various offences, to road sign meanings and speed limits. Again, the best way to ensure success is to simply memorise the answers, especially as the language used can be confusing.The theory test is available in English, Russian, Japanese, Spanish and French, but the questions can often be worded in a way that makes them difficult to understand. 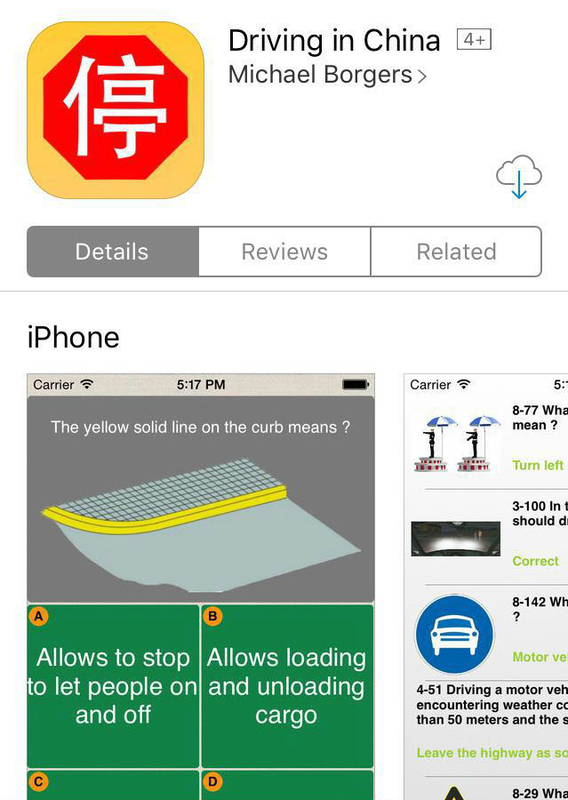 We downloaded the Driving in China app (1.99USD) and spent our metro journey to and from work and lunch-breaks going over and over the questions. The latest version of the app was released in August 2015, so you may find some of the questions are worded slightly differently to the actual exam, but for the most part it's accurate. The ability to do mock exams on the app also makes it well worth a download. The SVMB have a couple of websites that they recommend too, and we also found the Chinese Driving Test website to be a helpful resource. We really can't emphasise enough how important it is to memorise the answers rather than trust common sense or what you assume to be logical. If you're successful, you'll be able to head downstairs to get your driving license printed right away. Basically, a guy stands there laminating card licenses and calling relieved examinees up one by one to collect them. You can usually have your new Chinese driving license in your hand within 15 minutes of completing the exam. If you fail the theory test, you'll need to arrange to sit it again. The test fee drops to 40RMB for resits. And that's it! Once you've got your license (usually valid for six years), check out one of the numerous cheap car rental services in Shanghai and plan your next road trip with some of our favourite nearby destinations below. If you need any help of transferring the driver license in GZ, I may help you sort it out. My we chat is yogurthugo. If you need any help to transfer your foreign license into GZ, do not hesitate to ask me to help.